Love them or hate them, it's hard to deny that Nickelback is one of the biggest rock bands in the world. While the band has a reputation for being one of the most hated bands of all time, they've done pretty well for themselves. As Deadpool points out, Nickelback is the 11th best selling music act of ALL TIME (take that, haters) and has earned six Grammy nominations. Ahead of the band's highly anticipated debut performance in Singapore this February, Bandwagon spoke to bassist Mike Kroeger (left) about 'How You Remind Me', dealing with internet trolls, Deadpool and more. Check out the complete interview below. What are you looking forward to about playing in Singapore for the first time? Like you said, it's the first time were playing in Singapore, so I think that alone is something to look forward to. Getting the chance to play in a new country after doing this for so long is so refreshing and we've heard great things about Singapore so we're all very excited. That would be one highlight but also, and more importantly, our fans have been waiting for a long time so we're happy to be able to finally make it there and play for them. It's exciting to go into the unknown, and this being our first time there, there are a lot of things that are unknown to us, a lot of things we'll learn about the culture but I'm not too concerned about anything, I think it's going to go great. It’s said that the band’s name stemmed from your old job at Starbucks, where you would often say “Here’s your nickel back”. Can you confirm this? (Laughs) Yes, that is absolutely true. I did in fact work there, and do that, and say that. It was kind of a funny coincidence that I caught myself saying that one day to a long line of customers and I made everyone in line wait while I called the band to ask them what they thought of the name. I turned back to look at the line during the call and everyone was not so patiently waiting. It took awhile for everyone to get used to the name but it all worked out. People seem to like and it has a certain ring to it, so we decided to go with it. The band was involved in the very first Spiderman film with 'Hero', which paved the way for everything that came after it. How does it feel to be a part of history? That's actually funny because while we were all involved in it, it wasn't exactly a Nickelback song. We had already made a lot of music as Nickelback at that point and when the song came up, when Chad brought the song to us, for some reason we all felt that he should release the song as a solo artist. We weren't really vibing with it for some reason, but we helped him out a little bit, so I can understand why many people consider it a Nickelback song, but yeah, looking back at it, we should've put the Nickelback stamp on it because it's probably one of the biggest hits of that era. (Laughs) I guess we made the wrong decision. After a long career, and nine studio albums, is there any song that you’re sick of playing? Not really, no. I'd get why people would feel that way, though. If we're not playing the same song, in the some room, in the same country all the time, we're fine. But thankfully every show is different and the vibes are so different in every city and country, the crowd reacts differently to the songs and it's a great thing to see. I just try to enjoy it as much as I can. I can understand why people would get sick of playing the same songs over and over again but I don't. For me, the songs that we play the most are the reasons why I'm able to do what I do. They're the songs that allow us to travel the world and play music for a living. I think we have to be a little selfless and still play them even if we do end up disliking them after awhile. It's just something you have to do. On the flipside, I do have a few songs that I think aren't being played enough. A lot of the new material, really. And there's a perfectly good reason for that; we only have a certain amount of time to play every night and we've been lucky to have a lot of songs that were successful, so I guess that's the upside and the downside to things. Because we want to make sure that the fans get to hear their favourite songs, we typically can't fit too much of the new material into the setlist. Another thing is that we've been to a lot of shows that just go on for hours and we don't want to put the fans through that. We can play for hours, but after while, it just gets a bit much from a fan standpoint, it can be exhausting. Let’s talk about ‘How You Remind Me’. How do you feel about that immortal single, 18 years on? It's funny because I actually just saw something that Kerrang! put out, where they broke down every second of the music video for that, it's nuts that its still getting that much attention. We're grateful, we really are. Having a song like that is like being the parent of a child that goes on to become a great success, you have this overwhelming feeling of pride. It's a huge part of us and we're really proud of it. More than anything, that song is a big reason as to why we still have a career. That song did wonders for us. We were doing well before that but that song just changed everything for us. Things expanded massively from that song. I think each of us in the band has a great deal of love for the song. How do you think the band’s musicality has changed from Curb to Feed The Machine? I think there's a little bit of a return to our roots. You could put the first album and the last record together, and there would be some similarities because I think Curb was broadly a hard rock album, as I feel Feed The Machine is too. Over time, making all these albums, Chad has become such a fluid and skilled songwriter; it's become amazing to watch and be a part of, watching him grow. Right now, no. What we have planned for majority of the year are tours. We don't have any plans to go into the studio this year, but that's not written in stone. We might do it, we just haven't discussed it yet, but I doubt we would have anything ready for this year because we do have a long year of touring ahead of us. That's not to say that there couldn't be a surprise and maybe we do something. We've recorded on tour, we've traveled to record, so you just never know. But I guess the simple answer to your question would be that we don't have anything planned yet. The internet is full of memes, and hating Nickelback has become a meme in its own right. How do you feel about the attention the band has gotten because of this? Initially, it kind of hurt our feelings. I think it's safe to say anyone in the world would feel that way if people were saying negative things about you. I think as time has gone on, it sort of became humorous sometimes. Sometimes people try so hard to be mean, that it falls flat and I think that's the case most of the time. It doesn't matter if it's my band or not, if someone says something that is legitimately funny, I'll laugh at it, especially if it's me. Sometimes people can just be outright nasty and take things too far, and start verbally attacking our families and sending us death threats and all that kind of stuff, and that's where you have to step back and think, "We're obviously doing something right if someone hates us that much", and you let it go because you have better things to do. I don't really see a benefit to reacting to these people and being nasty back at them. When it's funny, it's funny. How does it feel to be defended by Deadpool and how did that skit come about? Was it something the band was aware of, or was it a pleasant surprise? (Laughs) I think what I would like to do someday is one of those Ask Me Anything (AMAs) on Twitter, and have Deadpool reply for us. It's truly a huge honour to be defended by Deadpool. He's Canadian like us, so that's pretty great as well. It sort of was a surprise. When we first heard of it, it was because Ryan Reynolds reached out to us and told us his idea, but he hadn't shot it yet. He wanted to see if we were okay with it, which was totally a classy move, a very professional move on his part. We read the part and I was laughing the whole time, not only when Deadpool was defending us, but also when Fred Savage was attacking us. I thought it was hilarious. It wasn't that big of a surprise but it turned out even better than I had hoped, and hopefully that promo introduced us to a lot of new fans as well. We owe thanks to Ryan Reynolds and Deadpool. I think that if my family and friends and the people I care about are healthy and happy for the year, then it's a good year for us. In terms of the band, we're going to be touring a lot this year so I'm hoping everyone stays safe and healthy and we all have a good one! 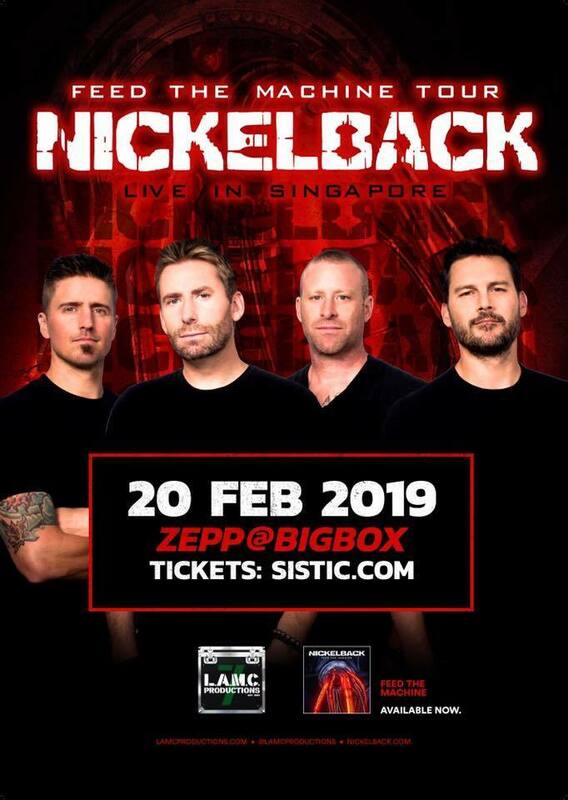 Nickelback is set to perform at ZEPP@BIGBOX on 20 February 2019. Tickets are now on sale at $128 for Early Bird passes and $138 for Standard passes. Get your tickets here.